Milwaukee – It is home to the largest Irish festival in North America called Milwaukee Irish Fest held every August on Lake Michigan’s shores. It usually tops the 100,000 attendance mark when the weather is fine for its four-day celebration of all things Irish. Famous as that festival is for hosting the largest number of entertainment and cultural acts on the 85 acres of the Lakefront Henry Maier Festival Grounds, its work isn’t over when the last notes of the Sunday night scattering are through and the last salvo of fireworks have been fired. Over three decades the Milwaukee Irish Fest has developed into one of the more important resources for Irish America through its year-round activities at its own center in Wauwatosa, Wisconsin that includes the Irish Fest Foundation and the Ward Irish Music Archives (WIMA) housed in the former Masonic Temple west of Milwaukee. Last weekend I attended a special program organized by the archives called “The Session! A Conference on Irish and Irish American Music and Entertainment” over three days. The Ward Irish Music Archives created in 1992 are named after John J. Ward, Jr., the father of Ed Ward, the founder of Irish Fest back in 1981. The archives contain the largest public collection of Irish music in the U.S.
With more than 20,000 recordings in formats going back to the early wax cylinders of the late 19th and early 20th century, to the latest contemporary music -- 5,000 pieces of sheet music in house -- the collection has 40,000 Irish music artifacts which would include hundreds of t-shirts garnered by Dr. Mick Moloney over the years. Recently the WIMA were able to release a CD from the Dunn family collection of 32 rare cylinders recorded by Captain Chief O’Neill displaying some of the very valuable work that director Barry Stapleton and his college Jeff Ksiazek do there day in and day out. The second floor of the Irish Fest headquarters houses much of the collection, including an alcove recreation of a parlor room with a working player-piano and cylinder players and early phonographs for all the various formats (78s, 33s, 45s). The sizeable body of sheet music tells the history of Irish America and reminds us that parlor singing and entertainment predominated before the days of recordings, radio and television. Among the sentimental items on display were the first Aran sweater that Tommy Makem ever wore here, a tin whistle and even his first banjo. Stapleton told us over the weekend that while they don’t get an influx of visitors to the archives, one of the primary future objectives is to make digital records of much of it to be shared over the web. If you are out in Milwaukee during the year or can carve out an extra day when taking in a future Irish Fest (third weekend in August) which I heartily recommend, you can view these treasures and much more there on Wauwatosa Avenue. At the conference itself there were topical lectures on Friday and Saturday following the opening night Chuck Ward memorial lecture presented by Dan Neely, an ethnomusicologist living in New York who talked about the history of the Irish music session as a form of Irish entertainment. It was a lively discourse taking us from early sessions here in the Northeast, and it included possibly the last interview this summer with fiddler Larry Reynolds, who talked about Boston’s first session at the Village Coach House. Among the highlights was a very interesting paper by Dr. Lachlan Whalen called “Port an Deorai: Songs Composed in the H Blocks and the Paradox of Exile,” with fascinating details about those prisoners who faced incarceration and endured the hunger strikes and blanket protests, yet managed to communicate with the outside world about their struggle. We looked closer at the Paddy Killoran Orchestra which went well beyond ceili music with archivist Jeff Ksiazek, piping with Chicago piper Patrick Cannady and a in-depth history of Irish cylinder recordings with archivist Stapleton, who served as the knowledgeable and amiable weekend emcee as well. Video recordings of an early Makem and Clancy PBS show vividly exhibited their performing charms for an audience or camera, and we also learned more about pioneering Irish American performers like Rosemary Clooney via another video vault gem. Gene Kelly was being celebrated Saturday evening on the 100th anniversary of his birth and the 60th anniversary of the movie Singing in the Rain containing one of his most spectacular dance routines. What we also discovered to our amazement was that Kelly’s younger brother Fred Kelly taught him many of the steps and routines that would propel him to Hollywood stardom while the brudder carved out his own multifaceted career that included much of his own choreography and triumphs. His son Mike Kelly and daughter Colleen Beaman Kelly were on hand as an animated tag team for the very first time to share that history of Fred Kelly prior to the film screening. On Saturday Dr. John Gleeson, founder of the Irish Studies program at the University of Wisconsin-Milwaukee, also gave some insight into the folklore behind John Ford’s The Quiet Man which gave us a greater appreciation. Also we were apprised of small theater production by producer Adam Whiteman playing down south in Chicago called Music Mad: How Chief O’Neill Saved the Soul of Ireland, appropriately enough at a pub and restaurant named in memory of the Chicago police chief, Chief O’Neill’s. A highlight of the weekend was a Friday evening musical performance by fiddler Kevin Burke and singer/guitarist Daithi Sproule. 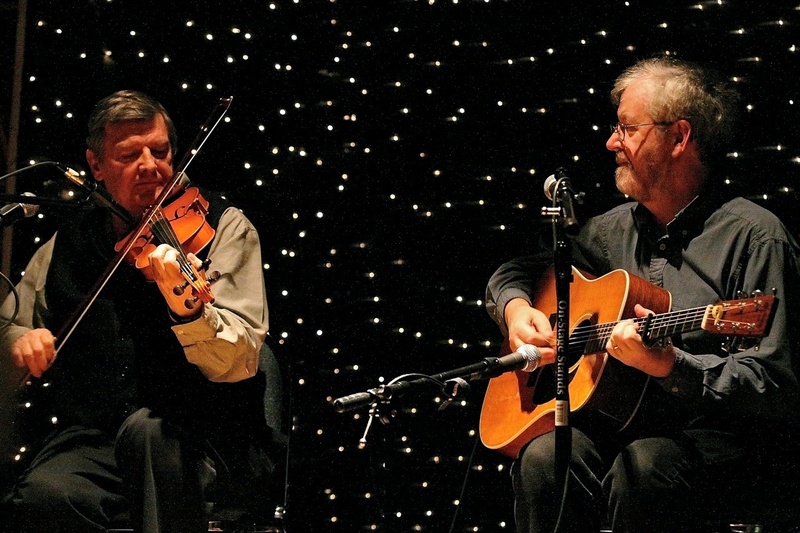 Both provided marvelous music and memories associated with their own collaborations, with the late Micheal O’Dhomnaill as part of their show in a special commemoration of Micheal’s appearances at Irish Fest. If you are interested in Irish America, Milwaukee should be on your bucket list. You can start your trip at Irishfest.com for inspiration.